LIBERTY V, 2012 Build, Albany, NY, USA Type: Bow and side loading USCG Inspected and certified. 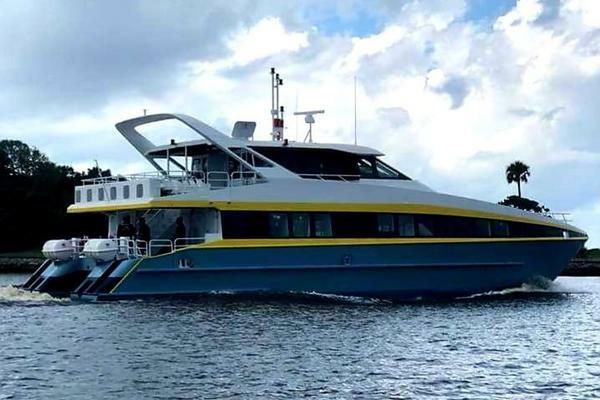 Passenger Vessel mono hull, main deck has passenger cabin with seating, below main deck is crew’s quarters with galley area. Upper deck has outdoor seating and standalone pilothouse. Dimensions: Length 75ft, Beam 22.5ft Draft 6 ft.
Capacity: Total Persons 152, Passengers 149, 3 Crew (2 Deckhands, 1 Master). Material: Steel (Corten) hull, Steel main deck, and aluminum superstructure (cabin, wheelhouse). Main Engines: Two (2) Diesel, MTU twelve cylinder, Model # 12V 2000 M61, 805 Horsepower each @ 1800 RPM. Twenty four (24) volt DC starting. Main engine hours, approximately 7000 hours. External Coolers: Furnstrum, total of five (5), two (2) main engines, two (2) generators, one (1) HVAC. Transmissions: Twin Disc Marine, Model # MGX-5147 SC, Ratio 1.96 to 1. Propeller Shaft: Diameter 3.5 inches, Aquamet 22-HS. Propeller Shaft Seal System: Water seal, Tides Marine, Two (2) pumps with alarm. Propellers: Counter rotating, ZF 38 inches Diameter, 4 Blade, Nibral alloy. Spare set: S & S 38 inches diameter. Northern Lights, Model M30CW, 30 KW, 120/208 Volt AC, Three (3) Phase,60 Hz @ 1800 RPM. Generator hours, approximately 6500 hours. Split system, nine (9) Dometic condensing units and air handlers. Engine Room Fire Suppression System: Kidde automatic CO 2, with manual release, visual strobe and audible siren. Fire Pump: Electric 7.5 horsepower, suction and discharge manifold. Fire Stations: Two (2). Bilge Pump: Electric 3 horsepower, suction and discharge manifold. Engine Room Ventilation System: Delta T, automatic. Oil Change System: Reverso, pump and suction manifold. Exhaust: Dry stack, silenced.